KingLouieLouie76 wrote: I wonder MrMagpie, did your local Classic Rock station ever spend the entire weekend dedicated to only playing highlights of the Beatle's recording sessions? To reiterate, mine did in the late 1980s - I've been trying to find out if that program that was played still exists. If it was a pre-recorded show in the first place (which, given the deep subject matter, it might have been?) there is surely a good chance that it has been saved. P.S. Louie - we can only think "what might have been" regarding a Beatles album in 1974, but that early 'Mind Games' evidently happened. Several years ago I emailed the station to find out if the show still existed somewhere, but they honestly did not know. Yeah... I heard that "Mind Games" demo on youtube and it was quite splendid! Was it a radio show called the Beatle Years? I remember my local radio station playing a program called the Beatle Years in the 1990s, but I can't recall what the topics were as they were so long ago. Speaking of Beatle radio shows, does anyone remember Paul's radio show Oobu Joobu? It ran in the 1990s. It had little interviews, some of Paul's favorite songs by other artists, recipes by Linda, outtakes, and whatever Paul felt like playing. I think I still have them on cassettes as I used to tape it whenever it played. I know there are bootlegs of it too. I remember Oobu Joobu and also the Lost Lennon Tapes radio show. You can get both of those on massive bootleg sets...some interesting stuff in there, for sure! I know this is a Beatles' thread obviously, but from a pure music lover standpoint... you must check out the Beach Boys Spotify and listen their compilations of re-issued material packaged with unreleased outtakes, tracks, demos, etc..... It's just so amazing! The Beatles and Beach Boys both had the best catalogues ever and they intertwined so much! I've just never gotten the whole Beach Boys thing (no offense) and personally I've never bought putting them on the same level as the Beatles. It's just personal opinion, and I do really like a LOT of the BB's output in the 1960s, but it always seems a bit forced to put Brian Wilson up there with Lennon/McCartney and the other titans of that era, as well as their music. 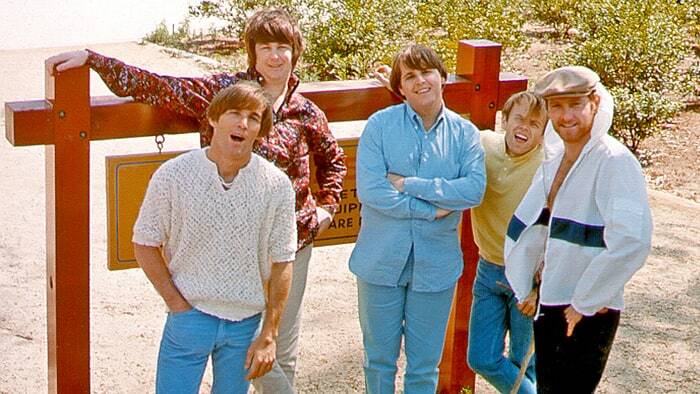 I dunno, like I said I like their music in the 60s but it still sounds very samey to me...even when they got experimental with Pet Sounds and Smile it still sounded VERY similar to their early stuff (the harmonies, the chord changes). And as good as it is, I find Pet Sounds to be one of the most overrated albums of all time. Not trying to be disparaging, just my $0.02. MrMagpie wrote: I've just never gotten the whole Beach Boys thing (no offense) and personally I've never bought putting them on the same level as the Beatles. It's just personal opinion, and I do really like a LOT of the BB's output in the 1960s, but it always seems a bit forced to put Brian Wilson up there with Lennon/McCartney and the other titans of that era, as well as their music. I dunno, like I said I like their music in the 60s but it still sounds very samey to me...even when they got experimental with Pet Sounds and Smile it still sounded VERY similar to their early stuff (the harmonies, the chord changes). And as good as it is, I find Pet Sounds to be one of the most overrated albums of all time. Not trying to be disparaging, just my $0.02. I perfectly understand. It's similar though for those who judge Blur based on "Parklife" and before though. I do not know if you ever listened to their post "Pet Sounds" effort (not including "Smile"). 'Smilie Smile" was a brilliant low-fi effort, but several were disappointed due to the pre-"Smile" hype. Then there are the following albums: "Wild Honey", "Friends", "20/20", "Sunflower", "Surf's Up", "Carl and the Passions:So Tough", and "Holland" which all spanned from 1967-1973 and then 1977 "Love You" are all worth checking. They evolved during that time and covered a wide array of music similar to what Blur did from "Blur" onward. Also, several singles and unreleased tracks are worth checking into. One difficulty for the Beach Boys, in relation to the serious music fan, is that most of their chart success (whether mid-60s in the USA, or late-60s in the UK) was with the 'surf pop' songs. When they reached into more progressive music, I don't think this came across to the pop fans (who took their loyalties elsewhere) or the rock fans (who probably struggled to view them seriously). Mallard No. 22 wrote: One difficulty for the Beach Boys, in relation to the serious music fan, is that most of their chart success (whether mid-60s in the USA, or late-60s in the UK) was with the 'surf pop' songs. Very true. And to my ears even when they went for the more interesting stuff in '66-'68 that surf sound was STILL there below the surface which kind of kills it for me a bit. Think of the White Album where every chord progression reminds you of A Hard Day's Night and you'll see what I mean. I generally if not always respect other conflicting opinion and varying tastes and I resent when it seems I am pressing someone on theirs, but your statement that the "surf sound" was still evident from '66-'68 is not completely true. Only one song they reverted back to that was the 1968 single (which appeared as the lead track on their 1969 album, "20/20") "Do It Again". They were in a nostalgia mood and wanted to recapture that sound. However, they did completely revisit the "surfing sound" on their mid-late 70s albums (except 1977 "Love You") due to the IMMENSE success of their 1974 greatest hits record, "Endless Summer". You mentioned '66-'68, but their albums from '69-'73 (and the aforementioned "Love You") are albums in which the casual music listener would be shocked to know it's the Beach Boys, especially when Carl and Dennis began writing more. Brian also tried to push the creative envelope, but Mike Love and even Al Jardine didn't like when they "messed with the formula", but they had completely abandoned the surfing motif/sound by that point. I apologize, but perhaps you might have overlooked some albums of theirs or don't have an entire accurate recollection of all those albums. But I know we differ on some Beatles' related matters at times. Such as I consider "Revolver" their best album and I feel "Sgt. Pepper" hasn't aged that well whatsoever and has become vastly overrated over the years. Again, we are entitled to our own opinion/taste obviously and I don't mean to be overly persistent w/my stance regarding the Beach Boys, but I feel you might be missing out on something more special than you realized or remembered. I went to see Paul McCartney last night. Simply amazing. He played for a full 3 hours. I’ve seen many artists play Beatles cover versions at gigs over the years but seeing one of the guys who actually wrote them play was unreal. As if that wasn’t enough they played Get Back in the encore with Ronnie Wood and one Ringo Starr! Amazingly some people had left at the end of the main set (I know London transport can be a nightmare) and they missed it. I saw the pics and videos of Ringo and Ronnie on stage with Paul...what a thrill! Ringo is still is steady as ever and I've always been a huge Ronnie Wood fan myself! I consider "Revolver" their best album and I feel "Sgt. Pepper" hasn't aged that well whatsoever and has become vastly overrated over the years. I like 'Sgt Pepper' but like many of the great albums of 1967 it is a 'timepiece'. i.e. it could only have been recorded in that year (or, certainly later '66 - earlier '68). The Stones 'Satanic Majesties....' and Floyd 'Piper....' are others. It was a very distinct time for music. By comparison, 'Revolver' is much more straightforward in production. Yeah, I can see where you're coming from. The Beatles sacrificed/compromised themselves to make a "period piece" and in the process it just seemed more for its time. "Revolver" is just timeless in every regard and that also includes the "Paperback Writer"/"Rain" single. I don't think though all of "Revolver" is straightforward, especially John's songs. Paul's was except for "Eleanor Rigby" and "Got To Get You Into My Life" to a certain degree. George was somewhat more straightforward on "I Want To Tell You" except the backing vocals and in the end of the song. The Beatles were to me at their best instrumentally on "Revolver" (and of course Ringo kicked arse on "Rain"). I still say George somewhat stunted his development on guitar (not saying he was sub-par but could have even been better) when he shifted his focus to sitar, but the sitar did provide an additional wonderful element to those songs. I feel though Paul was more nostalgic than any of the Beatles, especially "Good Day Sunshine" and even on "Here, There, And Everywhere" which he has credited the Beach Boys in influencing the harmonies. "Sgt Pepper", my fave track is "Fixing A Hole"...... It just flat-out rocks and there's always a constant debate whether Paul or George performed that wonderful guitar solo on it.... I've often believed it's more Paul than anyone else!